One hell of a monster movie, this one isn’t just a great creature film, but also a pretty cool sci-fi movie about a bleak future for humanity. We’ve seen movies about mysterious creatures and the rules that people have to abide by in order to avoid them, before, (most recently in Bird Box, only without the actual physical presence of the creatures.) 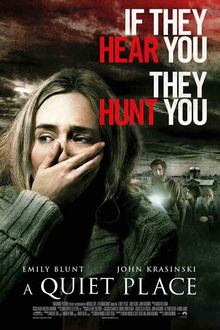 A Quiet Place does it better than most. It really works out exactly how this life of keeping practically silent at all times, could actually happen. And it does it while keeping us glued to our seats with fear of these attacks. The movie adheres to the general rule of these sorts of movies, such as showing us only flashes of the creature at first, and then slowly allowing us to see more and more of it. But for the most part, this movie feels like something fresh and innovative. That’s probably because of how much time and effort were clearly put into crafting out the logistics of this work. It isn’t often that we get a good, smart monster movie these days. There are the over the top, campy ones which are kind of fun, like Kong: Skull Island, and then there are the artistic, but kind of dull entries, like The Host. A Quiet Place, however, is the rare film that bridges the gap. This is the movie that does both things, giving a us a smart movie with thrills, and also some really cool looking monsters and attack scenes. This is the movie that takes the time to craft out what the world would be like if these monsters were real, and people had to learn to survive. The movie stars John Krasinski and his real life wife, Emily Blunt. It is Krasinski’s directorial debut, and you can tell this guy is a fan of the genre. You can tell that by the way he does everything right to avoid the cliches and give us new twists on old ideas. In that way, he’s kind of like Cabin in the Woods director Drew Goddard, making a movie that is clearly built on the backs of other films that it has learned from. And there’s nothing wrong with that at all. Learn from the mistakes of others, while taking lessons from the things that worked. With that in mind, A Quiet Place knows that it has to establish the threat of these creatures early on. If all we see is the characters sneaking around and being super quiet and cautious, then it’s not enough to glue us to our seats or get us hooked. And so we do get an early death scene. Now that’s especially hard to do in this type of film where there are so few characters. There are pretty much no extra characters to spare. Except for the kids. This family has three kids, and apparently that’s one too many. The movie opens with the family moving through an abandoned pharmacy store. We are shown this in pieces with some characters darting past the camera and lots of shadows and silhouettes. At one point, a child reaches for a toy on a high shelf and the toy falls. Luckily, this child’s older sister, Regan, is there to catch the toy before it hits the floor and makes noise. The family uses sign language to speak with each other and walks around barefoot. Everything is about being as silent as possible. When the small boy tries to take a rocket ship toy, complete with batteries to create sounds, the father, Lee (Krasinski,) tells him no. He tells him it’s too dangerous. And then the father leaves the store. That’s when Regan, trying to be a compassionate sister, helps the boy take the rocket toy, and keep it a secret from their father. And so the family walk begins. The characters walk in a single file line across an old bridge, and out into the woods. The middle child, a boy named Marcus, is either sick or injured (which is why he was lying on the floor in the pharmacy,) and so Lee is carrying him. And the smallest child is the last one in line. It’s during this walk that the rocket ship noise goes off, and the characters turn around. Lee starts running towards the boy. The other characters cover their mouths in horror. And suddenly a monster apprears in a flash and snatched the boy up. Cut to black. Now we know what they’ve been keeping so quiet for. The threat has been established. We rejoin the characters about a year later. From the very beginning, we saw that Regan is deaf and wears hearing aids. That’s why the whole family knows, and is able to use, sign language so well. The little boy sequence was especially great because we saw it from Regan’s point of view, with her not responding to the sound of the rocket ship, but instead reacting to seeing her parents turn around and face her direction, looking at the little boy behind her, in horror. Regan hasn’t forgiven herself for that. She blanes herself for her brither’s death, and believes that her father blames her as well. This is one of the major themes of the movie. Her thinking she is handicapped and the black sheep and responsible for what happened. We learn more about this in a number of scenes. The biggest one has got to be the waterfall scene where Lee takes his son instead of Regan, despite his protests and her wanting to go. While at the waterfall, the son asks Lee if he blames Regan for what happened and tells him that Regan blames herself. Long before we get to this, however, we are with the family in the house, establishing their world. And every little thing counts. We’re talking about having a car on the property that is more like a toy for the son to go in and pretend to be driving (you can’t turn the engine on, because of noise,) and the way the son climbs in through the window to make as little noise as possible. There are the monopoly pieces, made of paper so they won’t make noise, and the rolling the dice on the carpet. There are the lettuce plates, much quieter if they fall then glass plates. And all these little things count. There’s also a dry erase board down in the basement which tells us everything that Lee has figured out about the monsters, including their armor skin and their blindness. The monsters themselves are also pretty cool. The movie doesn’t go too far in explaining them or how they got there (and why should it, when it’s all just made up and would end up sounding silly anyway.) But Instead, it takes the approach that less is more, and that includes how little we see of these creatures in the first half. There are about three attacks (the boy, the raccoons, and the old man,) and one happens faster than the next. And then we get into the second half and the birthing scene and suddenly we get to see a little more of what we’re up against. The creature design is impressive. Practical effects would have been better than CG, which is what the movie uses, but even still, these things look good. And the more we see of the creature, the cooler it looks. 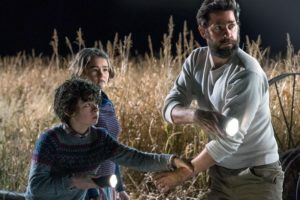 A Quiet Place works on multiple levels. Yes, it has the B movie feel of mist great monster movies (especially in its second half,) and it’s also got the smarts to create a future where people would realistically be dealing with things, and the details that go with that. Everything is worked out here from the sound proof barn basement, which becomes the nursery for the newborn baby, to the way that people light fires at night to let others in the area know who is still alive. This is a smart, fun, and thrilling movie.